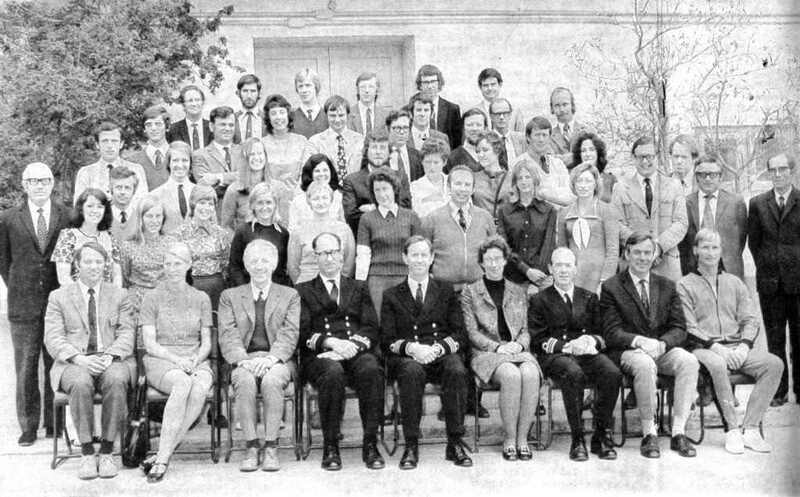 FRONT ROW : David Taylor, Mavis Turner, Stephen Singleton,, Lt. Cdr. J. Cottam, Cdr. M.F. Law, Pamela Smith, Lt. Cdr. C. McCafferty, Brian Leonard, Trevor Ricketts. SECOND ROW : Moira Clarke, Imelda Dickinson, Carmel Walsh, Maureen Whittle, Joyce Walden, Hilary Hill, Michael Caseley, Judith Stansfield, Sylvia Beckett, James' Hobson, Charles Aquilina, John Treeby. THIRD ROW : Laurence Bezzina, John Naylor, Hugh Ritchie, Norah Ash, Margaret MacKay, Kenneth Winn, Merilyn Manley-Harris, Rosemary Leighton, James Glover, Elizabeth Cole, Carl Hancock. FOURTH ROW : Jeffrey Bonner, John Clemens, Alan Latham, June Lattimer, Lewis Finnis, David Ditcham, Barrie Menhams, Robert Woolams, Ronald Ransom, Michael Newton. BACK ROW : Frank Kitson, Robert Ward, Barrie Jones, Philip Allen, David Walker, Peter Wright. ABSENT : Miss Mary Spray, Miss Helen Wilson, Miss Sandra Camilleri. Mr Ransom used to be my form tutor (1bx) and there's my favourite teacher Miss Walsh. I wouldn't know. Back in the sensible sixties, the magazines listed the staff with their subject but the practice didn't continue in the sloppy seventies! Miss Latimer taught Geography and yes Mr Bonner taught maths.